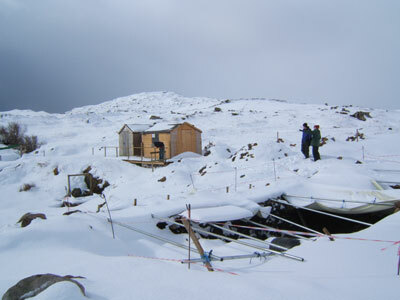 Despite some heavy snow over the past couple of weeks, fieldwork at the High Pasture’s site is now underway. Read on for the latest news and don’t forget to have a look in ‘The Work’ section to review the latest specialist reports. There is a feeling of spring in the air, despite the heavy falls of snow we have experienced in Skye over the past couple of weeks. The dry and sunny periods of weather between the showers have provided reasonable conditions to start work at the site. After finishing some house-keeping duties on site such as staining the two site sheds, maintaining the site perimeter fence and repairing the wet-sieving area, we surveyed in our new, extended site grid. The new grid covers a wider area around the core of the site and will be used during the forthcoming geophysical and topographic surveys. 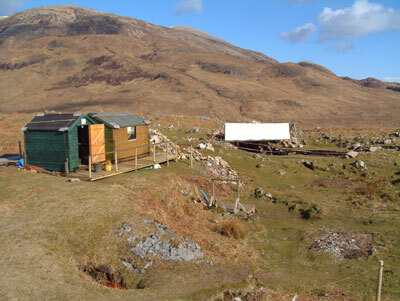 The geophysical survey will take place on site between the 29th April and 6th June, after which we will be starting the major excavations of the 2006 fieldwork season. On the 22nd March, we resumed the excavation of the stairwell, which provided access to Bone Passage (in the cave below) during the later prehistoric period. After installing new site datums, we removed approximately 0.3 metres of sediment and boulder fill. One of the rounded granite boulders was too large to remove by hand, so a lump hammer and chisel was used to reduce the item into more manageable portions. Otherwise, the excavation went well and we slowly started to reveal two more steps and courses of corbelled side walling. We had initially suspected a possible area of collapse on the northeast side of the stairwell. However, as we removed the fill from the passage in-situ stonework was revealed. The people who built this structure during the Iron Age some 2000 years ago, had relatively poor quality stone to construct this feature. Mainly comprising water-worn granite cobbles, some unusual building techniques had to be employed and it is amazing that the structure is still standing. Most of the sediment, filling the voids between the boulder fill in the passage, is quite clean with just a few small flecks of charcoal. However, as we cleaned down onto the newly exposed treads of the stone steps, we recovered larger fragments of charcoal, two sherds of prehistoric pottery (including a rim sherd) and several fragments of human bone. The bone most likely belongs to the primary burial uncovered during the end of fieldwork in 2005 and the location of this material, some 0.6 metres below the level of the burial, indicates that there must have been significant air-filled voids between the blocking material - allowing the bone to trickle down into these cavities as the human remains became disarticulated. The image above shows the stairwell from the south east, with the steep flight of steps leading down from the immediate foreground. The limestone bedrock is exposed at the back of the feature and the builders have keyed into this the granite cobbles that form the structure. 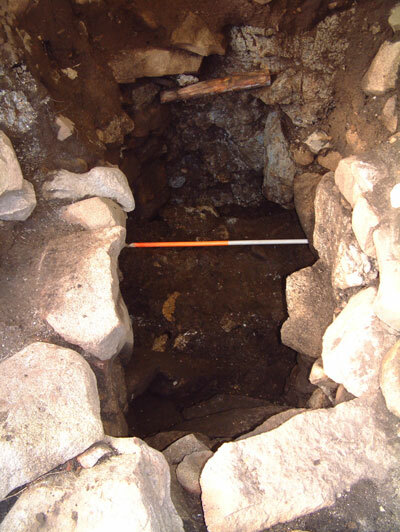 Remains of corbelling can also be seen in the image, which indicates that the entrance was once covered with a stone roof. We have removed in the region of 0.8 metres of fill from the stairwell so far, leaving between 1.5 and 2.0 metres to excavate, and a clear audio link has been established between the base of the excavation and Bone Passage below. Providing the weather holds out, we hope to continue with the delicate excavation of the stairwell. So visit the website again soon to see how we are progressing.